Cook the bacon pieces until crispy and remove from pan. Toss the chopped potatoes in bacon fat and sprinkle with ½ half of the BBQ Mix ' Rub. Line a pan with aluminum foil (for easy cleanup) and arrange the potatoes in a single layer. Bake for 30-45 minutes, until the potatoes are golden brown. Meanwhile, whisk the rest of the BBQ Mix 'n Rub, vinegar, Italian Herb Olive Oil, mustard and honey together until combined. Refrigerate until potatoes are cooked. 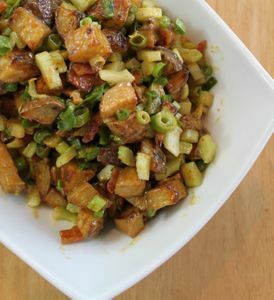 Combine the green onions, celery, bacon, potatoes and vinaigrette in a bowl and stir. Refrigerate for 1-2 hours and serve!